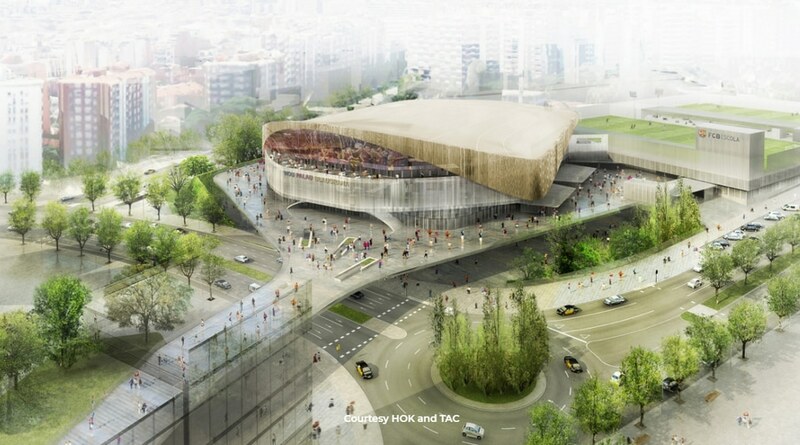 Multisport arena for FC Barcelona will be a key component of the new Espai Barça sports district Leading international sports venue architecture firm HOK has released design details for FC Barcelona’s new arena. 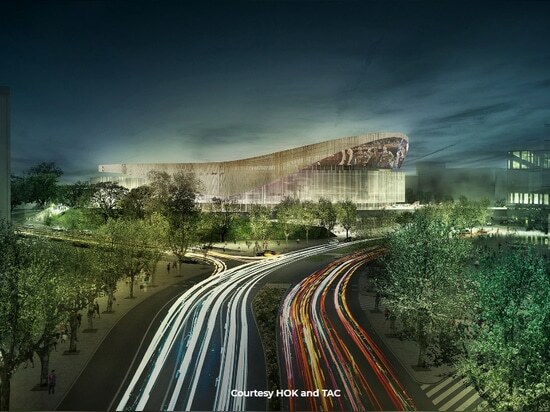 FC Barcelona recently selected HOK and Barcelona-based TAC Arquitectes to design the New Palau Blaugrana as part of an international architectural competition that drew responses from 19 teams. 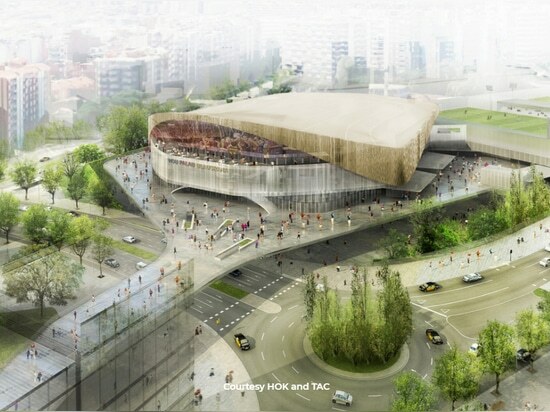 The New Palau Blaugrana, which will have a capacity of 12,000 for sporting events and 12,500 for social and cultural events, is a key component of a broader project to improve FC Barcelona’s facilities, including a major renovation of the Camp Nou stadium, in creating the Espai Barça sports district. 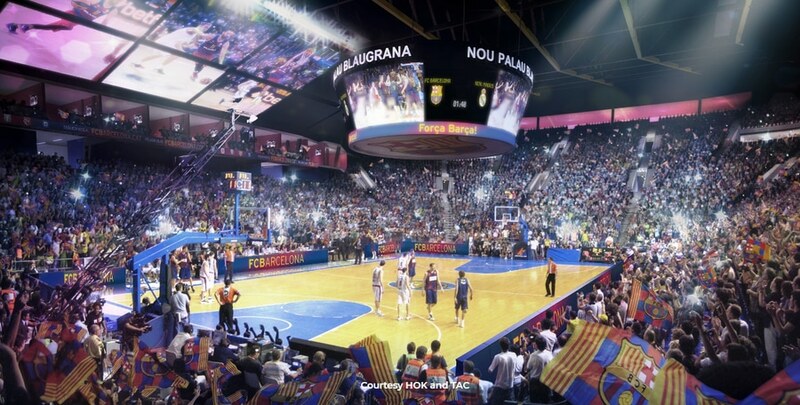 Construction on the new Palau Blaugrana is expected to begin during the 2017/2018 FC Barcelona basketball season and finish during the 2019/2020 season. 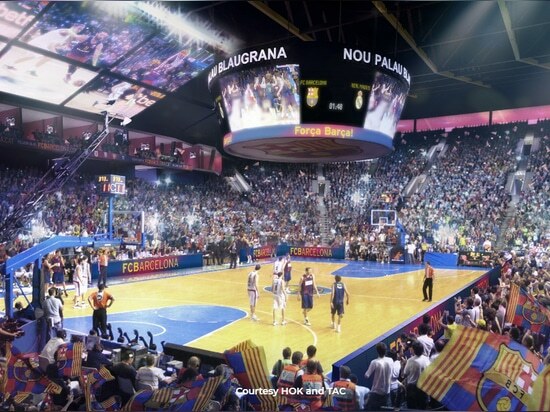 It will replace the 7,500-seat Palau Blaugrana, which opened in 1971. 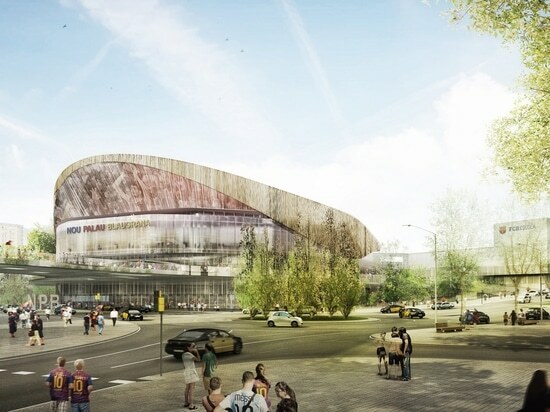 The New Palau Blaugrana will be built on the current site of the Mini Estadi, a 15,276-seat stadium. The building acts as a physical and visual anchor that aligns with the district’s existing architecture while making a bold, contemporary statement. 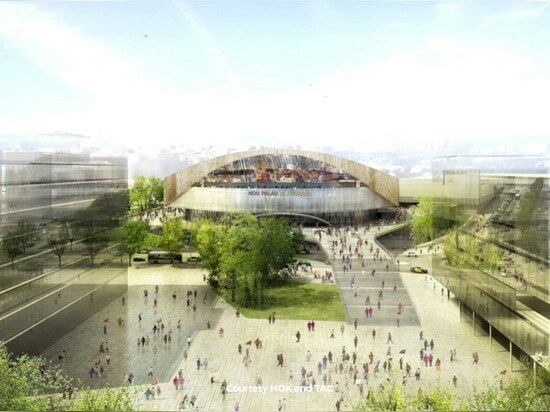 It also opens up and integrates the club’s venues into the Les Corts neighbourhood. 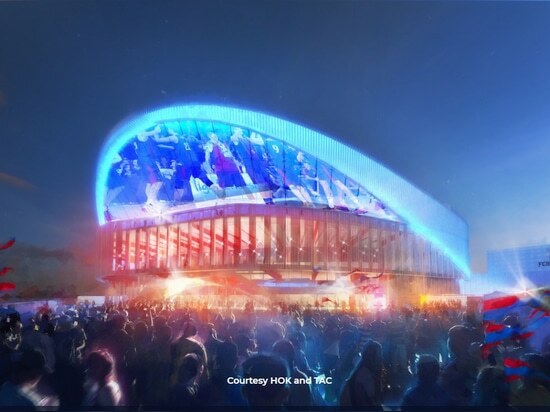 To engage fans beyond the arena’s walls, the design blends the indoors and outdoors. 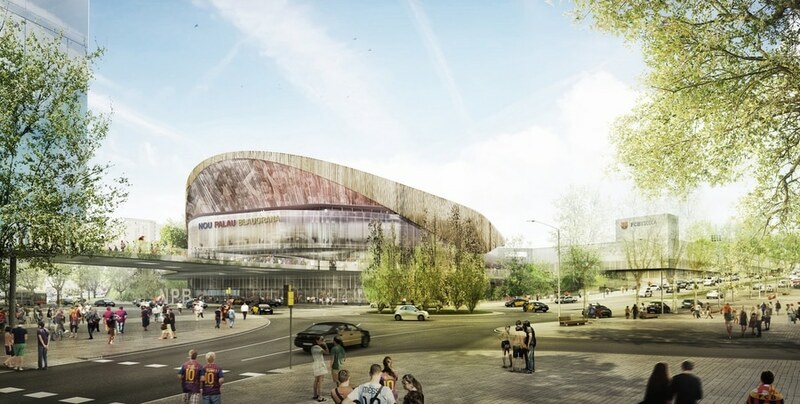 The arena’s curvilinear form includes an elegant, metallic facade strategically connected to the immediate and wider surroundings. This transparency creates an inviting atmosphere and provides glimpses of the action inside. A large projection screen on the underside of the arena’s roof will show footage of the event underway. An outdoor concourse features concession areas that the public can enjoy 365 days a year. An open-air, street festival environment celebrates the Mediterranean climate and provides year-round revenue opportunities. Outdoor patios, public plazas and green spaces across the site, which will be vehicle-free, create informal spaces for people to gather before, during and after events. The design maintains the current Palau’s reputation as a loud, energetic arena that provides a unique experience for European fans and the home team. 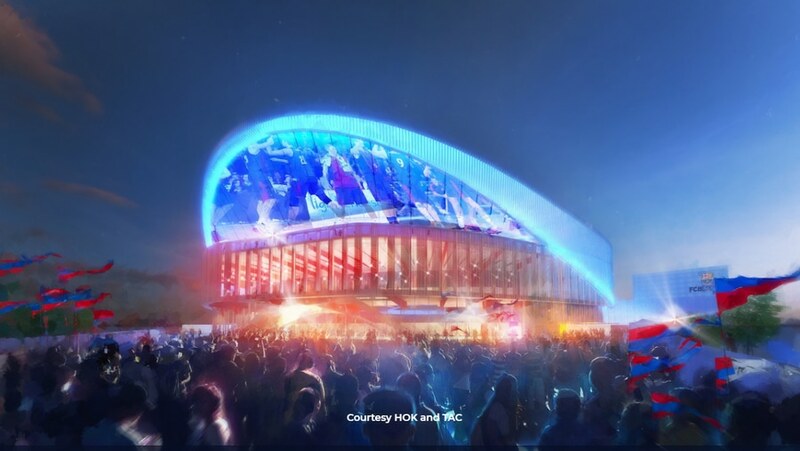 HOK and TAC designed the seating bowl to emulate a theatre environment, with an asymmetrical design—the first of its kind for a basketball arena—that provides more capacity on one side. Using state-of-the-art, customized digital tools, the designers calibrated the venue and bowl geometries to achieve optimal results for viewing quality, shape and dimensions of the event spaces. The tighter, steeper and more intimate bowl provides exceptional sightlines, creates a “wall of people” and captures the noise to create an intense spectator experience and intimidating venue for visiting teams. The compact building span reduces structural costs and improves operational efficiencies. The flexible, retractable seating configuration adapts for each use. Premium amenities include 24 VIP boxes and four sky bars/lounges that provide court views. 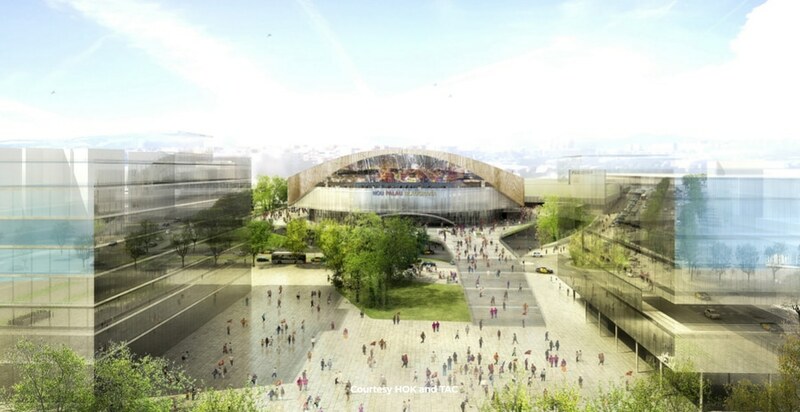 The project also includes three independently functioning areas: an adjacent court with capacity for up to 2,000 spectators, an ice rink with seating for 800 fans and the FCB Escola academy training facilities, which include two football fields.